Held each year on the first Saturday in July, at Aberdeen in the Upper Hunter Valley of New South Wales, Australia, the Aberdeen Highland Games have become become a recognised event on the National calendar, drawing hundreds of people to the township every year to enjoy the festivities. The 2019 Games will be a very special event marking the 20th Anniversary of the Games. There will be special happenings to mark this milestone so keep your eyes open on this site and on Facebook. The Games begin with a parade of bands, clan representatives and others that leads into the Massed Band Salute and Chieftain’s Address that officially opens the day. 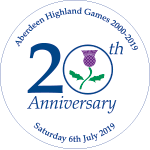 Throughout the day there will be fun for all the family – there will be Highland and Country Dancing, Pipe Band displays, Strong Man events with the Tartan Warriors to enjoy as well as tug-of-war, three-legged races, and the famed Kilted Dash to participate in. A multitude of stores and stands will surround the area selling all manner of Scottish heirlooms and souvenirs, clothing and garb, and food and drink to complete your day. In the evening there will be a traditional Ceilidh, to be held at the Scone High School MPU, as well as a Pipe Band Quintet competition at the Aberdeen RSL Club. Aberdeen Bowling Club, Aberdeen Motel, Aberdeen RSL Club Ltd, ADR Website Design, AGL Macquarie, Ausure, Berry & French Chemists, Celebrations, David Paradice, Dimmock’s Quality Meats, Drone AG, First National – Edward Higgins Parkinson & Co, Fraser family of St Aubins, Hunter Valley Printing, Hunter Thoroughbred Breeders, MacCallum Inglis, Mt Arthur Coal, Muswellbrook RSL Club, Osborn Bus Service, Regional Bank, Scone RSL Club Ltd, Scone Timber and Hardware, Scone Tyre & Battery, SG, N & MD Stafa, St Kilda Australia, The Hunted Gourmet, The Scottish Banner, Upper Hunter Shire Council, White Heather, Wideland Motor Group, William Grant & Son. Photo credits: Amanda Gaffney Ray, Max & Denise Bell, Catherine Clifford. We look forward to seeing you on the first Saturday in July. Follow us on Facebook, Twitter or Instagram to keep in touch with the latest news and information from this year's games.